Welcome Dear Readers to this week’s edition of Gregory’s Bible Stories. Today Gregory learned about when God had Adam name all the animals. It was the very first Tuesday right after God had created Adam but just before He created Eve. God took some soil from the ground and formed all the animals and all the birds. Then He showed them to Adam. God: I just created all these animals and all these birds. Now I’d like you to think of names for each of them. Adam: But there’s so many! God: Yup, 1,589,361 to be exact. Adam: Okay let me get this straight. You want me to cultivate the Garden of Eden and guard it plus think up 1,589,361 different animal names for all these animals you created? Not only am I only human, God, don’t forget I am the only human! God: It’s an acronym that means laughing out loud. God: Laughing. That’s hard to explain. Well here . . .take a look at this animal, it pretty much sums up my sense of humor. 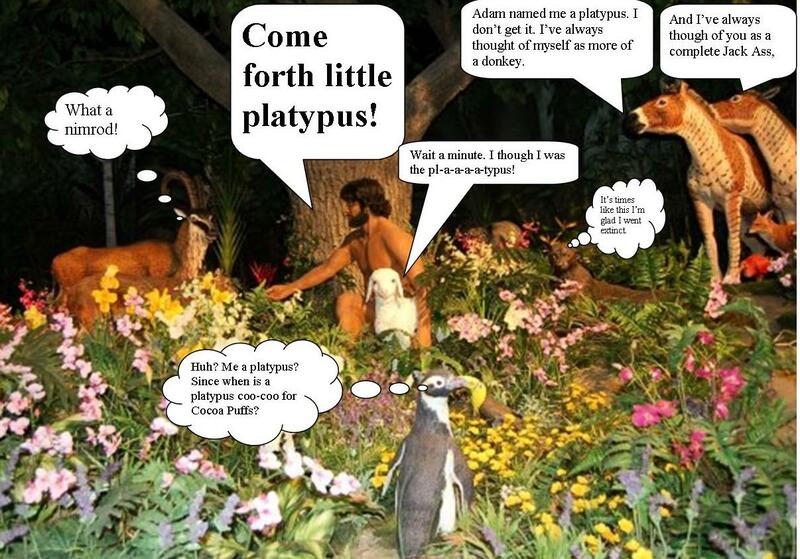 God has a platypus on a leash and hands the leash to Adam. Adam: Awesome! Fur, a bill, webbed feet! God: Yeah it’s venomous too which most people don’t know. God: Sorry, I got ahead of myself. So what would you like to name it, Adam? Adam: How about a glerk or a floob? God: Meh . . .
Adam: Oh I know! How about a tittlefuzzwamper! God: Okay I like the direction you’re going in now. Adam: Snickerdoodle . . .
God: Bingo! Good thinking Adam! Adam: This is fun! What’s the next animal you want me to name? God: How about this one? As you can see, it has two humps on it’s back. Adam: What are the humps for? Adam: Okay then, how about a platypus? God: You already named the platypus the platypus. Adam: Oh yeah . . . well how about flatypus . . . or . . . . oh I know . . . the blatypus . . . oh wait . . . natypus! God: Sigh . . .
Adam: What’s the matter, God? God: I was just thinking how long this is going to take. Adam: What are you complaining about? You’re the one that’s eternal! LOL! God: Adam! You made a joke! There’s hope for you yet, young man. Now think of some more names. Adam: Okay! How about a klatypus? Adam: Oh I know . . . platypus! That’s a good name, platypus! Or did I already use that one already? Hey what are you doing, God? God: Creating a chair . . .
And there you have it, Dear Readers, what Gregory learned in Sunday school this week. Please check back next week to find out what happens when Adam finds out all the insects are going to need names too.